I love love love crash reporting services like Sentry. Nothing allows me to quickly fix a bug that causes a crash like knowing about it the instant it happens. Recently I started using Cypress to perform end to end testing of my web applications. This tool is amazing in its simplicity and power; it quickly replaced PhantomJS / CasperJS / Nightmare / Selenium / Protractor tools I have used before. Once the number of tests has grown we hit a problem. During automated testing there might be crashes. These crashes are reported to Sentry (as they should!) 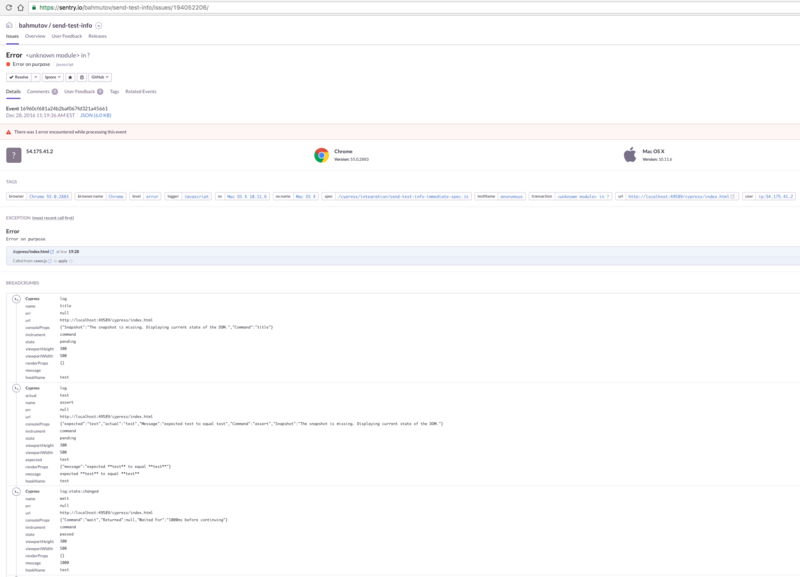 When a developer looks in Sentry at the exception's information, there is very little that can tie a particular crash to one of the E2E tests that caused it. In some cases the crash might be severe enough to fail the test. Often the crash happens, but the E2E test still passes because it looks at a feature unaffected by this particular error. Finding and fixing the root cause of these crashes becomes a guessing game; looking at bread crumbs and trying to figure out which tests might leave them is time-consuming. If only we could tell right away from the exception tags which particular E2E test caused it! This is why I wrote send-test-info function - a tiny utility that grabs the name of each test (and optionally the spec filename) and attaches it to the Raven client inside the window object. 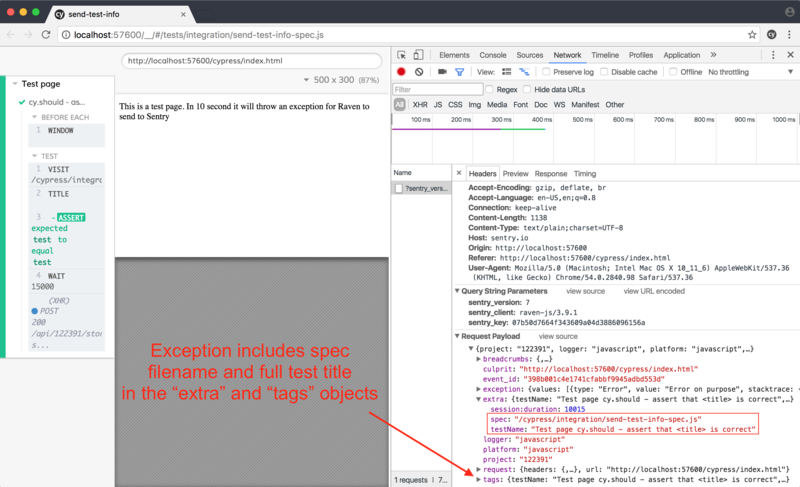 Under the hood sendTestInfo uses beforeEach BDD hook to grab the full test title. To actually access Raven object we need a reference to the "window" object and wait until Raven becomes available (which might be after going to another page for example after login). There are several ways to do this, I picked an interval timer. A simple E2E test included with the project shows that an exception sent over the wire includes additional fields. 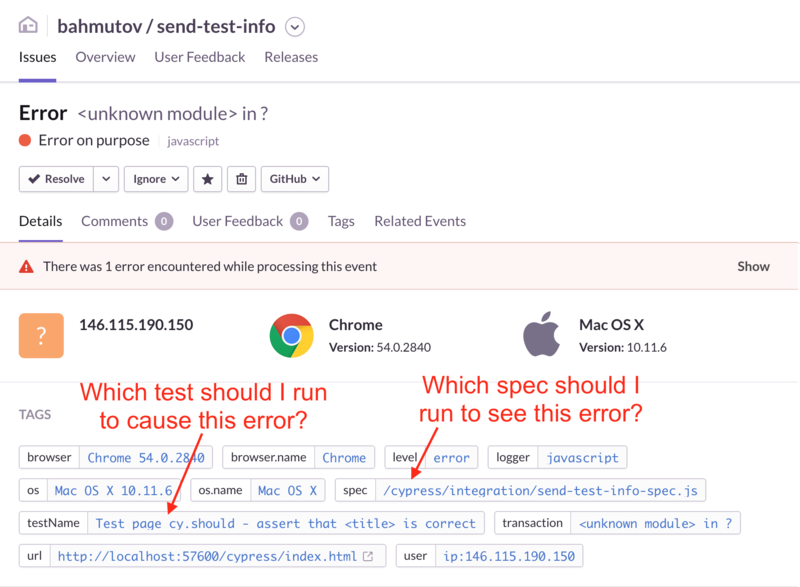 The Sentry issue view can now immediately tell us which spec file should be executed to debug the error, and which particular test caused it. This information would make debugging crashes that happened during E2E tests a pleasure rather than a chore. There more run time checks you use the better. I use lazy assertions liberally throughout my code because I do not trust the server or the user. You can even verify the data schema by building the runtime type check right into the constructors using Archetype. I added a listener that grabs Cypress events (try using Cypress.on('all') to start) and adds them to the Raven breadcrumbs list. The Sentry then shows a very useful list of test steps before the crash happens.